Pub in Chiswick. Previously known as the Barley Mow photo, it was refurbished and renamed to the Lamb Brewery in September 2012, and renamed again to The Lamb in late 2013. 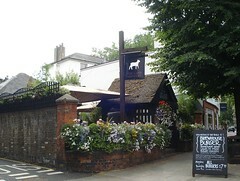 The name refers to the historical Lamb Brewery, which brewed in Chiswick until 1922 but has no connection to the present-day pub. Until late 2013 it was owned by Convivial London Pubs, but has now been taken over by Mitchells & Butlers as part of their Castle sub-brand. Under Convivial, it was a brewpub photo of brewing equipment, but according to the Dec 2013/Jan 2014 London Drinker magazine, they ceased brewing at the start of November 2013, following the M&B takeover. Kake visited on a sunny Wednesday afternoon in July 2013. The patio garden was pretty full when I arrived around 2pm, though there were still a few seats left outside and the interior of the pub was almost empty. Peaceful folk-ish music was playing quietly inside. The handpumps offered five real ales, including two of their own — Dark Ale (£1.85/half) and One In The Bush — as well as Kew Green (possibly the one from the Botanist in Kew?) and two from the Marston's Single Hop range (Pacific Gem and Endeavour). They also had four more of their own beers on keg fonts, including an oatmeal stout. A pint of lime and soda was a very reasonable 95p. Cured salmon ciabatta with dill and citrus dressing (£7) photo sounded good but was only average in execution; the salmon itself was fine, and the accompanying chips were skin-on (which I like), but the ciabatta was stale (to the point of inedibility in parts) and the chips were rather greasy. Kake's verdict: The food was pretty disappointing, but I love that they had two dark beers on, and I'd come back if I was passing just for that. Child-friendliness: One of the ladies' cubicles has a pull-down baby change table. Accessibility: A step to get in at both the front (patio) entrance and the back (Barley Mow Passage) entrance. It's step-free throughout once you're in. There are two heavy doors to get to the ladies' toilet, and the cubicles are tiny. Last visited by Kake, July 2013. Opening hours taken from the Lamb website, December 2013. Last edited 2013-12-12 12:15:58 (version 16; diff). List all versions. Page last edited 2013-12-12 12:15:58 (version 16).